This 1983 movie is based on the Cuban Mariel exodus of 1980. One man, Tony Montana, finds his way to a refugee camp in Florida. Montana later finds his way out of the camp before landing a job with a drug lord. He works his way up the ladder and takes control of most of his boss’ deals. Once at the top, his enemies become too many due to his actions and his empires comes done crumbling. The movie was availed in English and Spanish and sold in diverse parts of the globe. Our collection of Scarface posters will give you great inspirations and provide you with a powerful way to decorate your room interior. A Scarface poster can magically transform your wall from a lifeless space into an attractive part of the room. Look at "Scarface - Hawaiian Shirt," "Welcome to Miami" by Jota Leal, or “Scarface - Tub B+W;" these Scarface pictures can definitely add some color and life to the wall and make it a very important part of your interior design. Why not seize the moment to make a statement? Personally selecting a wall art for your space is something that many people long for. It endows you with the rear opportunity to make a personal statement and transform your room into a place that’s captivating to be in. 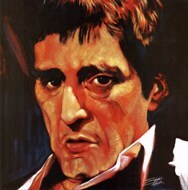 If for example you want to pick a Scarface movie poster for your room, you can do so while thinking of your favorite colors and the blends that will create a warm and friendly atmosphere. Think of the mood you would like to achieve and the kind of accessories that you already have within your interior. Then there is the option of selecting an enrichment option for your Scarface images. Here, you can also consider a number of things for the best results. For example, if you want things that match, you can choose framing and have the frame color match that one of your furniture. If you want portability and some extra protection for the artwork, lamination is a great choice. If however you need to add more aesthetically and make the artwork a lot more adaptable, canvas printing does it. Bring in your creativity and eye for color and you will achieve a lot.